The biggest fear parents have during divorce is the impact it will have on their children. Putting the needs and best interests of your children first during a divorce can look different for every family. Even during a time of great stress and turmoil, parents have a responsibility and opportunity to truly support their children. One way is to remember your child’s rights. 1. 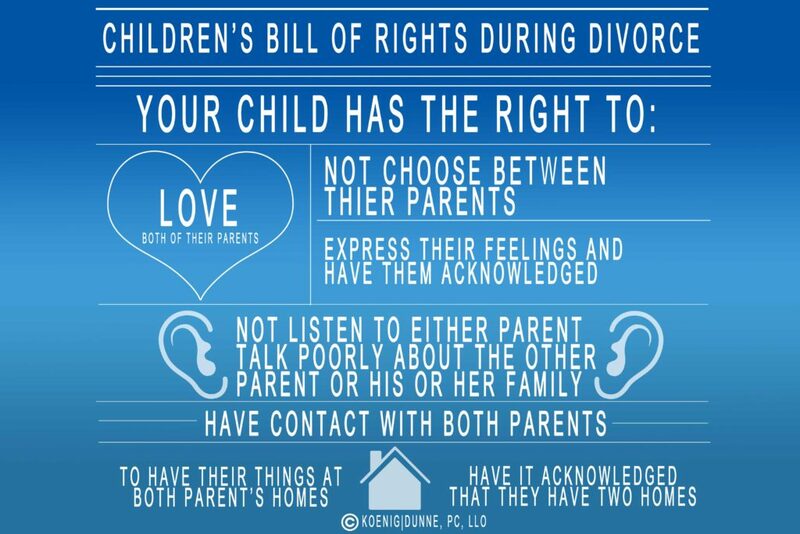 Your child has a right to love both of their parents. 2. Your child has a right to not to have to choose between their parents. 3. Your child has a right to not to have to listen to either parent talk badly about the other parent or his or her family. 4. Your child has a right to express feelings and have those feelings acknowledged by their parents. 5. Your child has a right to have contact with both parents at appropriate times, regardless of the parenting schedule. 6. Your child has the right to have their things at both parents’ homes and have it acknowledged that they child have two homes, regardless of how much time they spend at each. We know you want to be the best parent you can be during your divorce. Keeping the above rights of your child in mind during the divorce process can help your actions be aligned with your intentions when the going gets tough. If your child is of appropriate age (generally ages 8 and up), we encourage you to discuss these rights with your child to create an environment in your home that fosters open and honest communication and to support your child through this transition.